 Do you feel like you’re constantly losing track of time? Do you feel disorganized, unproductive and unable to keep up with your schedule? Introducing the Advanced Excel Time Tracking Tool – maximize your efficiency and GAIN time! Whether you are a freelancer, blogger, entrepreneur, stay-at-home parent or simply someone who wants to be more organized and efficient, this tool is for you! Use the dashboard to visualize exactly where your time is being spent! You are a freelancer or work from home and need to keep track of how much time is spent on each of your clients. You are a blogger and want to learn how to manage your time and tasks while balancing your side hustle with your full-time job. You have a hard time organizing your day and need to better understand how much time you are spending on each work assignment or project each day. You are simply interested in becoming an overall more PRODUCTIVE person. We’ve learned to maximize our time and you can too! As you may already know, we are a husband and wife team that have turned our mutual dream of running our own businesses into a reality. We quit our jobs to make money on our own time and we are here to teach other millennials how to do the same. In doing so, we realized how hard it is for people like us (people who live in front of a screen) to stay on track. We saw just how badly we all need to learn life hacks that will help us live more efficient lives. Together we are both Bloggers, Freelancers / Contractors, Small Business Owner & Quantitative Analysts. That’s a lot of different directions to be pulled in! You see what I said up there? “Make money on our own time”? Time is a funny thing. One moment it feels like we have all the time in the world and the next, time has run out and we don’t really know where it went. When you are committed to so many projects and tasks, it can be really hard to keep track of how much time you are spending on each. Especially if you eventually wish to be more productive and turn those hours into dollars. That’s why we decided to build an advanced Microsoft Excel time tracking tool (which we both personally use for our day-to-day tasks and projects – running it as this is written!). Rather than just offering time management tips, we thought an actual tool would be of even more value to you. 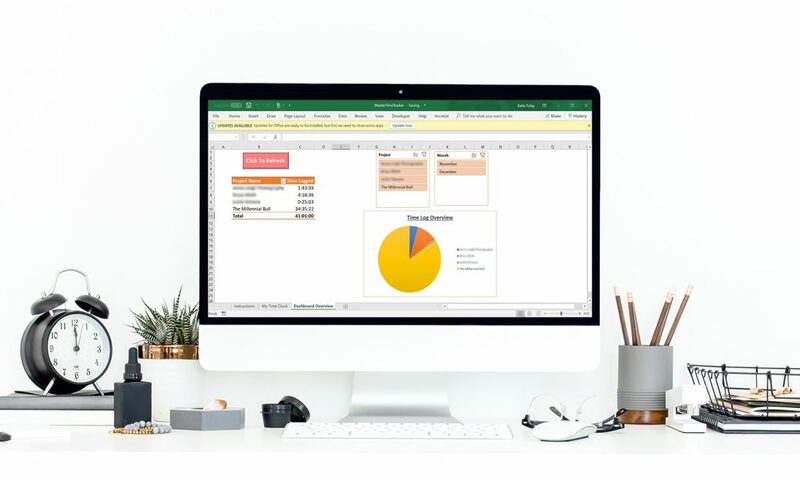 Our excel time tracking tool can be used by pretty much anyone: bloggers, freelancers/contractors, small business owners, stay-at-home moms… anyone who wants to keep track of their time and be as productive as they possibly can. As freelancers, bloggers, and business owners, the tool has helped us both with our organization and time management. I can’t tell you how many times I have meant to work on Projects A, B and C in a day, only to lose track of time and only fit in A. I have also glanced at the clock, told myself I would definitely remember what time I started working on any particular task, only for hours to pass and for my mind to go blank when I go to write down my billable hours. Other times I have switched to another project without paying attention to what time the switch happened, and when I am done I’ve got no clue what the split is. Or, how about those menial distractions? Little things pop up between tasks ALL the time. It’s easy to get confused when you’re trying to log your time, recalling that long conversation you didn’t expect when the doorbell rang. With our advanced excel time tracking tool, you can control all of those issues. It’s as simple as hitting ‘Start Clock’ on sheet/tab 1, labeling the project that you are working on (ie. “Client A”), and a note to identify the current task. When you are ready to move on to say, blogging, start a new time session, label your project (ie. “The Millennial Bull”) in the time tracker and jot down your item. The dashboard (tab/sheet 2) will track your total time spent by project/client, and by month, with various viewing options. Also included is a pie chart to visualize how your time is categorized. At Katie’s most important request, we’ve also included two color versions because, you know… options. Sam is an expert VBA tool builder and has written and customized the code used in this tool. He is a risk analyst with strong Microsoft Excel skills. When he worked for his previous employer before leaving to pursue his own entrepreneurial ventures, he had built dozens of excel tools for various projects mainly to simplify repeated tasks. Some of his tools are designed to automatically go into 100+ different workbooks and make updates to them or pull out data. Then additional analysis and calculations are done before closing all the workbooks and saving them. These tasks can take a few days to do manually but with VBA macros, these repetitive tasks now take less than an hour to complete. A plus? If we ever update our advanced time tracking tool (current: Version 2.0.0), any previous buyers will receive the updated version free of charge!